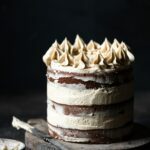 Chocolate Sunflower Cake is a layer cake made with chocolate sunflower butter cake, then frosted with sunflower butter and vanilla buttercream frosting. Preheat Oven to 350 F and prepare three 6 inch cake pans. Lightly grease each pan and line the bottom with parchment paper. In a medium bowl hand whisk together flour, cocoa powder, baking powder, and salt. Set aside. In bowl of stand mixer fitted with paddle attachment, cream together room temperature butter, brown sugar, and granulated sugar. Add SunButter, vanilla, and oil. Mix on medium low until creamy. Scrape bottom and sides of bowl as needed. Add each egg one at a time until incorporated. Pour in milk and water. Mix until incorporated. Slowly spoon in flour mixture, scraping bottom and sides of bowl as needed until cake batter is formed. Divide batter equally amongst the three cake pans and bake for 30-35 minutes until toothpick inserted into center comes out with just soft crumbs. Place cake pans on cooling rack until completely cooled. Remove cake layers from pans, wrap in plastic wrap and freeze for 30 minutes. In bowl of stand mixer fitted with whisk attachment, mix together room temperature butter, SunButter, vanilla, and milk until creamy. Slowly add powdered sugar a cup at a time and mix until desired consistency. Remove cake layers from fridge, unwrap and peel away parchment paper. Level cake tops with knife if needed. Place a dollop of buttercream onto cake stand. Place bottom cake layer onto dollup. Cover top of cake layer evenly with buttercream, using an offset spatula. Add second layer and cover top with buttercream. Flip top layer upside down, with flat side as the top of cake. Using spatula cover top of cake and lightly spread buttercream across the sides. Use a bench scraper to smooth top and sides. Option to completely cover cake with buttercream. Transfer remaining buttercream into piping bag with desired piping tip and pipe a ring of decor.